Why are we celebrating Founder’s Day today? What are heirs? A Prince is usually an Heir as he will become King. So an Heir inherits something from those who have gone before him, so this line “All the heirs of its traditions” is really saying that as Wynberg boys you will inherit traditions from those who have been here before you. Traditions represent a critical piece of our culture, but before we can speak of traditions we have to understand what Culture is. Culture really is “the way of life for an entire society.” In our case “the way of life of the entire school and Wynberg Community”. It includes our manners, the way we dress, our language and the way we speak it, our behaviour and what we as a group hold as core common beliefs. 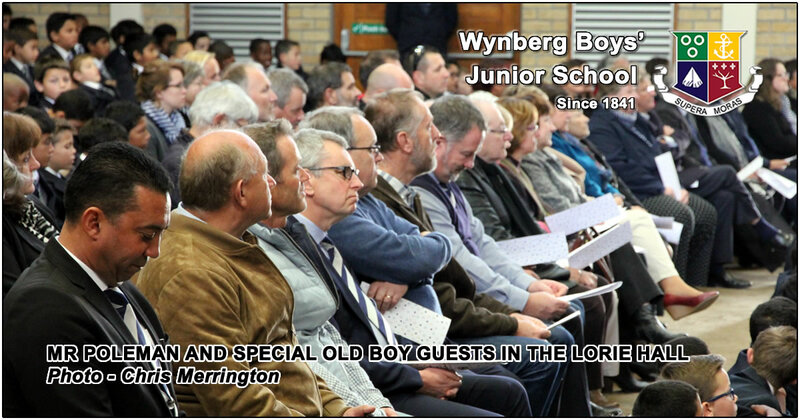 Today we are joined by Wynberg Men who finished their schooling here in 1977, 40 years ago, seated in the front row with Old Boys across the generations. Welcome to you all. These Old Boys represent the passing on of the culture and traditions of Wynberg from one generation to the next. What you experience whilst at school you will pass on to your children. We hope that your sons, will in time, become Wynberg Boys. Traditions and Culture though are not static, they don’t stand still, they constantly change as each generation contributes its experience of the world and discards things that are no longer useful to them, and embraces those things that resonate, and have societal relevance. Like most cultures, our traditions at Wynberg play a significant role in creating the bonds that keep us together. The bonds that have brought people back to be with us on Founders’ Day. They help form the structure and foundation of this our Wynberg Family and our broader community. They remind us that we are part of a history that defines our past, shapes who we are today, and who we are likely to become. Once we ignore the meaning of our traditions, we’re in danger of damaging what underpins our identity as a school. Tomorrow [Friday 25 August 2017] our Grade 7s join us in the Clegg Hall at WBHS for their Founders’ Day Ceremony, during the course of which, Headmaster Mr Jan de Waal, and I will be announcing the new names of our school houses. It has been an exhaustive process, but a rewarding one, in which our two schools, and Old Boys’ Union stand united in building on the good traditions of the past. All our teachers and other staff play an important parts as leaders and role models, using every opportunity to reinforce the values and beliefs that we as Wynberg hold dear. Today you will be addressed by Mr Gregory Ferguson-Brown, the Headmaster of Bishops Preparatory, who like you is a Wynberg Boy. He attended Wynberg from Grade 1 to Matric and was brought up in the value system which we cherish and are inculcating in you. Mr Brown, who previously taught at SACS, was also the headmaster of the The Grove Primary, my previous school before taking the Headmastership of WBJS. As such, his values as a Wynberg Man have been shared with many of the leading schools in Cape Town, indeed South Africa. Mr Brown, we welcome you ‘back home’ to Wynberg, and thank you for agreeing to address this present generation of Wynberg Boys. Glebe – original home of the Wynberg Boys’ Schools in 1841. Oude Wijnberg – the original estate where the Jacques Kallis Oval is today. Silverhurst – former Junior Boarding house. Sunninghill – the land where Nixon’s School was located before moving to the current WBJS area. Hawthornden – the estate on which the school was built. Trovato – the area that marks our place on the Wynberg Hill. Littlewood – the Boarding House, opened in 1957. McNaughton – Wynberg’s first Headmaster in 1841 when the school was co-educational and open to all races.